It was clear from the start that this was going to be a project that documented a whole new thrust of Heaven 17. Not only had founding member Ian Craig Marsh left the band several years earlier, but they had also picked up new performance members over the intervening years. It was these members who gave this band an incredible amount of power and now they’re aloft in ways that they possibly never have been. The first half of the program was largely dedicated to the vital first two albums. It’s great that even thought “Luxury Gap” was by far the bigger seller of the two, that they never give “Penthouse + Pavement” short shrift, as it obviously occupies a significant place in their hearts. When the laser hits “We Live So Fast” it’s apparent that the band had entered a whole new realm of live performance. The difference is immediately felt with bassist Julian Crampton, who brings a CV filled with jazz and funk influences. He’s in my Record Cell on albums by Stephen Duffy and Basia, but he really has room to move with the material of early Heaven 17. I feel as though he had been holding out on me earlier if this was what he was capable of! The band were incredibly lucky to have stumbled upon their first bassist at the time, John Wilson. He only played on the first three H17 albums, [and that seems to be the breadth of his musical career] and since his departure, there has been a John Wilson sized hole in the group that Crampton brings more than enough spackling to and fills quite easily. Hearing him play alone, on these tracks, elevates them immeasurably from the “laptop rock” live H17 sets of yore. He’s already been recorded on their new single from their upcoming album, and I can’t be happier about this outcome having heard his performance here already countless times since buying this package last October. This music absolutely pops with the kind of energy that only live, and accomplished, playing can offer my ears. When a guitarist like Asa Bennett was also added to the mix, then the possibilities quadruple. Bennett is a presence on all of these songs; adding guitar filigree in cases where the original tracks had none at all. Better, his inventive approach also sees him using a midi guitar to drive synths in some cases! Every song here benefits from even a touch of guitar, and in many cases, more than that for a transformative feel. The band was also abetted by jazz keyboardist Berenice Scott, who is fully capable of filling the sort of role that Nick Plytas originally brought to the first two Heaven 17 albums. She can take the keys much further down the road than Martyn Ware could all by himself. Finally, Al Anderson on electric drums completes the last piece of the Heaven 17 live puzzle. He has a great synthetic tone that approximates the sound of the earlier drum machines that Ware used in the Human League prior to the Linn Drum Computer, which simply ran from acoustic samples, for a worst of all worlds approach. Here the group’s sound returns to the Kraftwerk paradox of synthetic sounds being triggered by a living, breathing human. The best of all rhythmic worlds. Next: …But what about the songs? 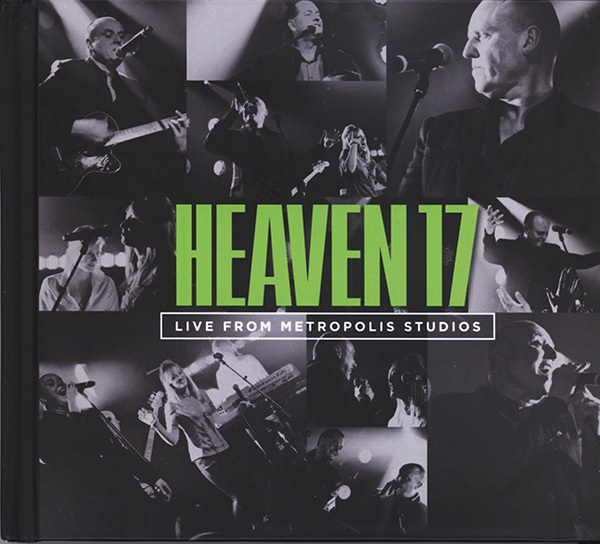 This entry was posted in Core Collection, Record Review and tagged 2013, DVD, Heaven 17, live album. Bookmark the permalink.